Wireless proximity alarms from Sigalarm are now being produced in the U.S. after being reshored from China. Photo courtesy of Sigalarm. When the work of heavy equipment operators brings them near high-voltage overhead power lines, they’re often too preoccupied with the job at hand to know just how close those power lines really are. Even when they are paying attention, problems with depth perception can impede their ability to correctly judge the distance between overhead power lines and booms. Allied Safety Systems, Inc., doing business as Sigalarm, has built its business model around solving that problem. Sigalarm is a manufacturer of power line warning systems that are used around the world to help equipment operators avoid the dangers of accidentally hitting a live power line. 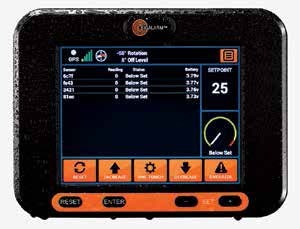 The company’s proximity alarms have protected people and costly equipment from making inadvertent contact with high-voltage power lines across a range of work sites. Its products include hard-wired and wireless proximity alarms for fire trucks, television news vans, construction cranes, aerial work platforms, and pipeline construction equipment, among other applications. “Sigalarm’s proximity alarms are designed to electronically back up a trained operator who might not realize how close he or she has gotten to an overhead high-voltage power line,” wrote Sigalarm President Lance Burney in a letter to customers on the company’s website. Because its products are built to save human lives, Sigalarm takes the quality of its manufacturing very seriously. Quality, therefore, was a major consideration when the company sought to enlist the services of an electronics contract manufacturer to back up its incumbent manufacturer. Its search culminated with the selection of Quality Manufacturing Services, Inc. (QMS), of Lake Mary, Florida. Quality Manufacturing Services is an employee-owned (ESOP), ISO 9001:2015 certified company that operates late-model, high-speed surface mount technology (SMT) at its 44,000-square-foot facility, located just five miles from Sigalarm’s headquarters. The company uses lean manufacturing techniques and environmental impact self-containment programs at its facility, which features static-dissipative flooring to prevent damage to components from electrostatic discharge (ESD). QMS President Sam Hanna said that QMS’s quality platform enables the company to post very high Five Sigma and, sometimes, Six Sigma performance consistently, even while running between 25 and 45 different part numbers every week. “Every week, we’re flipping our lines to the tune of 25 to 45 different assemblies, and we’re still able to maintain that kind of quality level,” he said. Burney said that when he and his wife Kim bought the business in 1999, they inherited a contract manufacturer in Rockledge, Florida, near Cape Canaveral. But when the economy declined a few years later, they decided to move the company’s contract manufacturing to Intellitec Products, LLC, a designer and manufacturer of electronic and electromechanical systems in Deland, Florida, about 20 miles away from Sigalarm’s Sanford headquarters. As Sigalarm’s established manufacturer, Intellitec continues to build wired and wireless proximity alarms for Sigalarm. But then the economy started growing again, and Sigalarm saw a sharp increase in sales. Burney said it was a perfect time to pick up a second, redundant manufacturing partner that was local and known for high quality. This would give the company a contingency plan if a natural disaster or other unforeseen supply chain issue occurred. 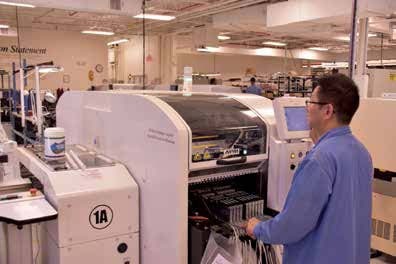 High-speed surface mount pick-and-place technology in operation at Quality Manufacturing Services, Inc. (QMS), Lake Mary, Fla. Photo courtesy of QMS. Both Sigalarm and QMS take pride in the fact that they manufacture in America. Burney said that Sigalarm’s hard-wired warning system has always been manufactured in the United States, but when the company designed its wireless alarm about eight years ago, it began manufacturing it in China. Burney is adamant about the need for quality, and he willingly embraces a larger truth about manufacturing in America: Top quality commands a higher price. He acknowledged that the price of producing Sigalarm’s wireless alarm in the United States was “significantly higher” than it had been in China. What does QMS do to ensure consistently high quality? Hanna said it begins with an emphasis on process and ownership by every employee. “We put the responsibility on the individual, and the way we manage the company is not with fear, but with consistent and instantaneous feedback. If a mistake is made at any point in the manufacturing cycle, they get instantaneous feedback from the next downstream process,” he said. “Every employee in production is authorized to ‘stop the line.’ It doesn’t happen often, but they’re authorized to get out of their chair, go to the previous process owner, and let them know that they’ve created some scrap, or they’ve done something that doesn’t match process. “So, the first thing is we build into the mindset of every employee that it’s their responsibility to do perfect work, and not to pass down to your neighbor something that’s not perfect. The second thing that we do is we have quality engineers that manage the process end of what we’re doing in production, and then the product end. We have a quality engineer that looks at processes, and we have a quality engineer that looks at outgoing product. When discussing the advantages that Sigalarm gains by making its products in America, Burney settled on one overriding factor: peace of mind. TGW Planning to Double Manufacturing Capacity in the U.S.